Physical Release of Axiom Verge Coming… for Wii U?! Hey, remember when 2016 was the 30th anniversary of a game franchise and Nintendo celebrated it by doing… uh, nothing. They did nothing. Unless you’re counting Metroid Prime: Federation Force, but we suspect you may be throwing things at your screen because we even brought it up. Um, sorry? But look, that’s where indies stepped in, and by indies we mean the breakout game Axiom Verge, which was heralded as a love letter to Metroid. It received rave reviews from critics and fans alike, and we consistently had a great time with the game. Now it seems that the title has done so well, it’s getting a physical release so that it can reach even more fans! And it’s coming to the Wii U. 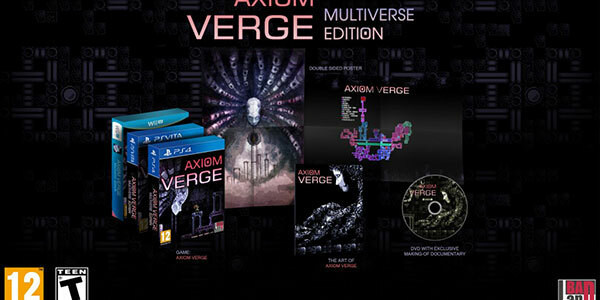 Yes, you read that correctly, the Axiom Verge: Multiverse Edition will be heading to store shelves sometime between now and the end of June, and the edition will include the game, a development commentary/art booklet, a poster, and a documentary about making the game. It’ll cost $29.99 USD, and will be available for Wii U as well as PS4 and PS VITA. According to the developer, Tom Happ, this physical edition is something fans have been clamoring for since the original launch. Dave will tell you that he likes to play video games, this is in fact a lie. What he really likes to do is buy games, and leaving them sitting unopened on his shelf. He is a monster.